Water, barley, yeast and hops. Not much of a recipe, really. And yet, when selected carefully, treated properly and combined creatively, these humble ingredients can produce a truly wondrous result. But it seems to me that there must be some other ingredients secretly mixed into truly great brews. Recently, I made the pilgrimage out to Foresters Falls near Cobden to visit one of the area’s newest breweries — Whitewater Brewing Co. — in order to find out a little bit about the mysteries of beer brewing and, perhaps, discover their secrets of the sauce. Chris Thompson, one of the founders of Whitewater Brewing Co., confirmed that the only things in their standard repertoire of beers are the traditional four (except for their Midnight Stout, which features oatmeal as an additional ingredient). As a company, Whitewater also tries to source its materials as locally as possible. According to their website: “At Whitewater Brewing Company, we care about what our friends drink, and therefore we care about what goes into our beer. Using just the traditional four ingredients (water, malted barley, hops and yeast), we carefully brew our unfiltered beer over a two-week period, allowing the beer to condition and naturally clarify.” They use fresh leaf hops grown on Allumettes Island between Pembroke and Chapeau, and Ontario-grown barley. They do not chemically adjust their water, they do not add clarifying agents — their product is as natural as it gets. 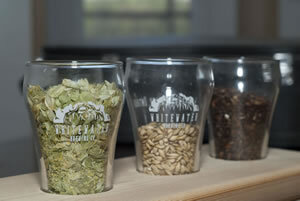 From these basic ingredients, Whitewater produces its four year-round brews: Farmer’s Daughter Blonde Ale, Whistling Paddler English Style Ale, Class V IPA, and the aforementioned Midnight Stout. Chris explains that the goal with each of these was drinkability: “with our basic beers, we tried to keep to a reasonable alcohol percentage and no extreme flavours.“ In essence, they are all excellent “session” beers. To spice things up, they also produce seasonal beers that are only available for a few months. Their spring beer is called Jacked Rabbit Espresso IPA, in which Cascade, Centennial and Nugget hops are mellowed by a smooth blend of cold steeped espresso sourced from Neat Café and the Madawaska Coffee Company. For summer, watch for their rhubarb wheat beer offering. Whitewater Brewing Co. was founded in 2011 by Chris Thompson, James Innes and, coincidentally, another fellow named Chris Thompson. The trio met while working as rafting guides at Wilderness Tours in 2006. It was there that they discovered a shared love of craft beers and hatched the plan to open their own brewery. 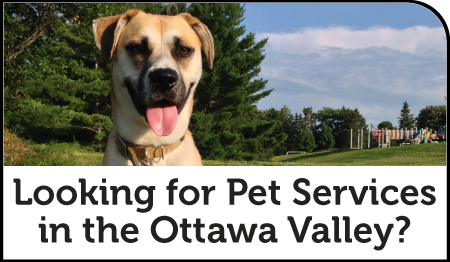 In doing so, they became part of the growing industry in Ontario. Craft brewing differs from large corporate brewing in that it recognizes that, throughout history, breweries have been an integral part of their local communities and the beer produced reflects the pride, passion and personality of the brewer and the community. Chris, Chris and James reflect that philosophy throughout their business, right down to the name, which attests to their love of kayaking and rafting on the Ottawa River and the Whitewater Region where their brewery is located. The hallmark of craft brewing, though, is innovation — and that again is a hallmark of Whitewater’s approach to both beer brewing and business. From their modest beginnings, producing 150 litres per week, they have been able to sell out by maintaining an active network of friends and fans who help spread the word. They consistently re-invest their profits back into the business and, at the time of our interview, were able to produce 1600 litres per week. By the time this article is published, they production capacity will be 2100 litres per week. All of this growth is not simply for growth’s sake, according to Chris: “we do it because we can sell everything we make!” And they definitely do not want to disappoint any fans by running out. But their innovative drive is not limited to just brewing. When I visited the brewery, they were also well underway on renovating a large part of the space to create a brewpub on the premises. The pub should be open by mid-June (check Whitewater’s Facebook page for updates) and will feature dishes made from ingredients sourced entirely within the Ottawa Valley. They will even use spent grain from the brewing process in their pizza bases. And perhaps one of the coolest bits of creativity that is also completely in keeping with Whitewater’s outdoorsy philosophy: re-fillable, pouch growlers! Instead of trying to portage your canoe to your campsite lugging a 2-litre glass bottle of your favourite Whitewater beer in your backpack, you can carry in (and carry out, of course) one of these. If you are looking for Whitewater beer you can skip the Beer Store, 'cause they aren’t there. 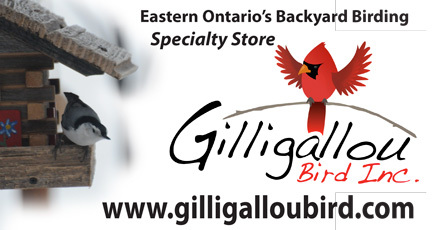 For the time being, you can find their products at almost forty pubs and restaurants in the Ottawa Valley including Ballygiblin’s in Carleton Place, The Cheshire Cat in Carp, and Neat Café in Burnstown. For customers who are lucky enough to live between Arnprior and Deep River, Whitewater offers home delivery of growlers and mini-growlers. Hopefully, home deliveries in other areas will be available soon. 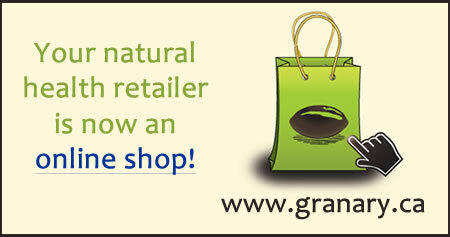 If you are in the Almonte area, Whitewater has a special offer, with a story behind it. Dan Fallak of VersaTile recently produced some custom coasters for Whitewater. 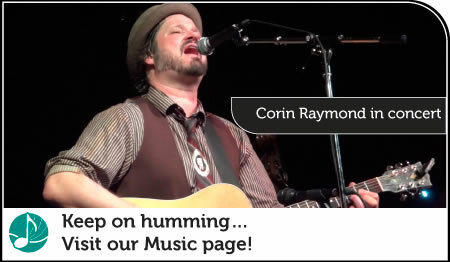 Dan is also half of the dynamic duo behind Small Town Thinking (along with theHumm’s own Miss Write, Emily Arbour). Dan and Emily have had a backburner dream to bring a craft beer to Almonte for quite some time. When Dan met with Whitewater he realized that the time was right to make this project happen, and so Mexican General Limited Edition Cerveza was born. The launch party for this limited edition beer is already sold out, but visit <almontebeer.com> to order your own growler of this light, refreshing summery beer. So perhaps, the secret ingredient isn’t so secret. Chefs know it, and apparently it’s true in beer brewing too: food (or beer) prepared with love tastes better. For full contact details, a photo gallery and more, follow the links at the top of this page. Almonte-area food Blogger Rebecca Eide was tasked with coming up with a recipe using one of the brews from Whitewater Brewing Co. Check out her recipe for Salted IPA Bagels, right here! 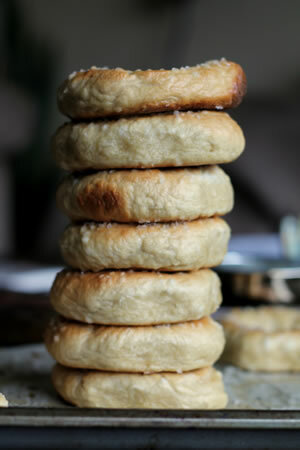 Salted IPA Bagels; recipe adapted from The Sugar Hit by Rebecca Eide for theHumm Online. Start by placing your beer in a small pot over medium heat until it reaches about 105-110 degrees F. If you don’t have a thermometer, don’t sweat it, just heat it until a puff of steam comes out of the pot, then remove it from the heat. You want to be able to put your finger in the beer comfortably. If you can’t keep your finger in it, it’s too hot. Add the yeast and 1 tbsp of the maple syrup to the warmed beer and whisk it until the yeast dissolves. Set it aside for 5-10 minutes. 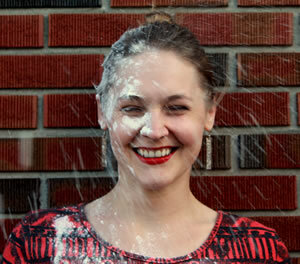 In the bowl of a stand mixer, add the flour, white sugar, and salt. Whisk to combine. Using a hook attachment, add the beer & yeast mixture to the flour mixture and knead on low speed until it comes together to form a ball. Then, turn the mixer to a medium speed and knead for 1 minute. Cover the dough in the bowl with a damp towel or saran wrap, and let it sit for 2 hours in a warm place to rise. After 2 hours has passed, bring 6 cups of water to a boil in a medium pot over high heat and add the other 2 tablespoons of maple syrup. Allow the water to boil over medium-high heat. Divide the dough into 10 equal pieces. You can do this by eyeballing it, or if you have a scale, you can weigh the whole dough ball and divide it’s weight by 10. Now is a good time to preheat your oven to 475 degrees F and line a large baking tray with parchment paper. Using a cupping motion with your hand, cover the dough and work it into a ball using a circular motion on your counter-top. Press your thumb through the center of the ball to form a hole and widen the hole to 1-1&1/2 inches. Place the raw bagel in the boiling water for 30 seconds and remove it with a slotted spoon. Repeat with each bagel and place them on your prepared baking tray. Sprinkle your bagels generously with the sea salt and place them in the oven to bake for 10 minutes. After 10 minutes, reduce the heat to 425 degrees F and bake for 10 more minutes. Allow them to cool before cutting into them. These freeze really well, just make sure you slice them before you freeze them. For the full post on Rebecca's blog with accompanying instructional photos, click here. 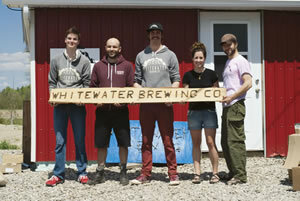 Profile | Gallery | Info for Whitewater Brewing Co.